The DUP has agreed a deal to support the minority Conservative government. After talks at No 10 between Theresa May and DUP leader Arlene Foster, the pair hailed the agreement between the two parties. Mrs Foster said she was "delighted" an arrangement had been agreed. The Prime Minister said the DUP and the Tories "share many values" and the agreement was "a very good one". 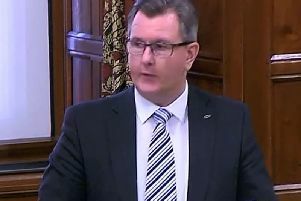 The agreement was signed by Tory chief whip Gavin Williamson and the DUP's Sir Jeffrey Donaldson while Mrs May and Mrs Foster, along with Damian Green and Nigel Dodds, watched on. Speaking in No 10, Mrs May said: "As we set out at the beginning of the talks, we share many values in terms of wanting to see prosperity across the UK, the value of the union, the important bond between the different parts of the United Kingdom. "We very much want to see that protected and enhanced and we also share the desire to ensure a strong government, able to put through its programme and provide for issues like the Brexit negotiations, but also national security issues. "So the agreement we have come to is a very, very good one, and look forward to working with you." Mrs Foster said: "We're delighted that we have reached this agreement, which I think works, obviously, for national stability. "In terms of the Northern Ireland Executive, of course we are determined to see it back in place as soon as possible as well, because we believe we need a strong voice for Northern Ireland when dealing not least with the Brexit issue." Outside Downing Street, Mrs Foster said a £1.5 billion funding package for Northern Ireland has been secured as part of the deal. The money will be used to boost the region's economy and invest in new infrastructure, health, education and other sectors, she said. She added that the funding would "address the unique circumstances" of Northern Ireland and the impact on its people. UK-wide, the pensions triple lock will also stay in place and there will be no means-testing of winter payments, under the arrangement. In a statement, Mrs May said the deal reached with the DUP was a "confidence and supply agreement", under which the Northern Irish party undertakes to support the Conservative Government on votes on the Queen's Speech, the Budget, and legislation relating to Brexit and national security. "The agreement makes clear that we remain steadfast to our commitments as set out in the Belfast Agreement and its successors, and in governing in the interests of all parts of the community in Northern Ireland," said Mrs May. "I welcome this agreement, which will enable us to work together in the interests of the whole United Kingdom, give us the certainty we require as we embark on our departure from the European Union, and help us build a stronger and fairer society at home." Turning to the situation in Northern Ireland, the Prime Minister added: "Time is running short for the parties to come together and reach agreement to re-establish a powersharing Executive by June 29. "I hope the parties will look beyond their differences and come together with a shared sense of common purpose to serve all communities in the best interests of Northern Ireland. Northern Ireland needs a functioning devolved government at this important time. "Her Majesty's Government will continue to do everything we can to work with the parties in Northern Ireland, alongside the Irish Government, to bring back a strong voice at Stormont for a positive future for everyone in Northern Ireland." The DUP and Conservatives have also agreed that a Nato commitment to spending 2% of GDP on the armed forces will be adhered to, and that the Armed Forces' covenant will be fully implemented in Northern Ireland. "Our aim in these negotiations has been to deliver for all of the people of Northern Ireland," Mrs Foster said. "And the support measures which we are announcing will be to the benefit of all our people." The DUP leader said the financial support would be made up of £1bn in new funding over the coming two years, as well as "new flexibility" in almost £500m already committed to the region. Mrs Foster said she would return to Northern Ireland for talks aimed at restoring a powersharing executive in Stormont, that was collapsed by Sinn Fein earlier this year amid a growing rift between the party and the DUP. Both sides have until the end of the week to do a deal. "Now, more than ever, our political leaders both locally and nationally need to work together to find solutions for all of the people we serve," added Mrs Foster. WATCH: Who are the DUP's 10 MPs?